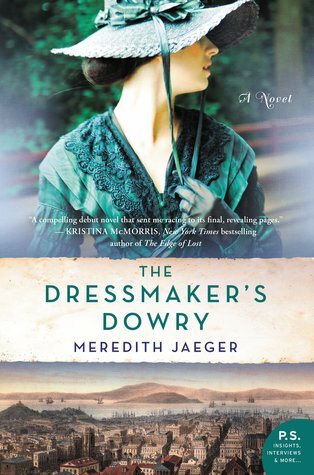 This gripping historical debut novel tells the story of two women: one, an immigrant seamstress who disappears from San Francisco’s gritty streets in 1876, and the other, a young woman in present day who must delve into the secrets of her husband’s wealthy family only to discover that she and the missing dressmaker might be connected in unexpected ways. Told in both the present and the late 1800s this novel was intricately woven from two different stories for much of the book. The present day story of Sarah, who is on the cusp of a crisis as a novelist and within her marriage, felt detached from the historical line. I found it a bit difficult to attach to Sarah, mostly because I felt her caginess with her husband unnecessary. She was worried about him finding out about an accident in her past which was causing hesitation about her desire to have a child. I didn't understand why she couldn't tell him and it made me distrust her so I could empathise with her husband. On the other side I was drawn to Hanna immediately. Her energy and silent rebelliousness came right off the pages. In a dire situation with little money, siblings to care for and an abusive father she had nothing but herself to rely on. I felt the bond between herself and Margaret and could appreciate how much she wanted to help the only person she felt she could rely on. I loved the desire between Hanna and Lucas. They seemed to be two of a kind and yet their circumstances kept them apart. Having set the two scenes the author then links them with a mystery and a ring and I was on the edge of my seat with the historical drama and who had done what. I didn't work out the whole plot until the very end. Though my bond with Sarah was lacking I think the rest of the novel carried me through and I wouldn't hesitate to read Jaeger's next book.